PLEY - Legitimate Competitive Threat, Complimentary Solution or Terrible Idea? Curious as to everyone's thoughts on Pley. They received a healthy dose of capital today. I think they are changing their business plan, as their original idea of borrowing sets like a Netflix idea is horribly flawed. I think they looked at Lego Ideas, and thought that maybe they could do that better and faster. I think it will be a horrible failure, in my opinion. I just don't see how they can make money at it. Complimentary solution in my mind. Based on what the article says their use of 3D printing in the future is an interesting and hopefully viable way for us to solve complicated problems. Whilst I love to challenge myself to solve building problems there are a few new pieces I wouldn't mind creating. I'll have to investigate this and see how commited I want to be with Pley but it sounds like something they have to get right before I trust them. I think the borrowing idea is kind of stupid, but seeing as how the person who created the set doesn't make any commission from the set being made I could see them making some money (though not much...it all really depends on who their suppliers are; not just for the Lego bricks, but boxes, paper/cardboard for instructions, etc.). Sounds like it'll be as useful and popular as BrickLink's efforts: https://cuusoo.com/brands/cuusoo-brick. It sort of suggests that they'll be manufacturing the bricks rather than using LEGO: "simply upload your photos, spread the word to get 5,000 votes, and we will make your set using our machinery, so thousands can enjoy it!" I think it has a lot of potential down the road if done properly. So, they aren't going to use genuine Lego bricks? Why bother then? If I want a set of Minifigures and an M577 APC from the movie "Aliens"; is PLEY going to obtain licensing rights to produce the set? I have seen some of the 'brick' made with a 3D printer. Not impressed. I think where 3D printing is going to thrive though is building carbon fiber panels for real cars. ^ You're not impressed yet. How many consumers in the not so distant future would love to download a set from Lego and send it to their home 3D printer and have it ready for the kids to build in a couple of hours. You could have that hard to find set without spending a ton of money on it. Or, better yet. How many consumers would make a licensed set just for themselves and are not intending to resell it. Something where Lego couldn't get the rights to. Pley realizes the real money is in competing for the #2 slot behind lego. But this isn't the way to do it. When technology hits the point of quality 3d printing that everyday people can afford, that will be the real threat to lego. Do people want Lego or something like Lego? Why do people buy Lego? Is it the quality? Is it the nostalgia? You could have that hard to find set without spending a ton of money on it. But then you'd have to ask yourself, "Does piecing together printing the parts for a set from PAB and Bricklink in my home count as 'owning' a set?" Ouch. Well played Sir...well played. It'll be interesting, will Lego sell you a set that you can print using your own consumables but at the same price as it is available in store. Seeing as a lot of the price is in the design and marketing, then why should print-at-home people get it cheaper than those buying genuine lego in store - much like buying a movie or music download. It would also be interesting to see how they would allow you to print - just one copy of each brick (or a fixed number of multiples where appropriate) so that you cannot print multiple copies (and sell them) if you purchase just one set. I think people are too taken with 3d printing. While it is fascinating and does have some excellent application, 3d design (and particularly good 3d design with good engineering) is really difficult. I think equating a 3d printer to a standard ink printer is a very misleading comparison because anyone can use a word processor to type a document, but creating a workable lego piece in a 3d design software, that's a completely different thing. ^not if you have image mapping software that does it for you. For stuff like Lego compatible bricks it wont be that easy though. Getting good clutch on them will be a pain, especially when you take into account head calibration on each machine. anyone can use a word processor to type a document, but creating a workable lego piece in a 3d design software, that's a completely different thing. It's worth keeping in mind that it wasn't always this way. Learning older versions of Word Processing software was non-trivial. 3D design and 3D printing now, is pretty much where Word Processing and printing was in the 80s in terms of relative ease of use and quality. I doubt it'll really take more than 10 more years before 3D printing is mainstream, and 3D design is much easier. Also, just as scanning and printing technology grew up together and really moved forward in the 90s, I suspect you'll start to see improvements in 3D scanning which will also make things easier. While this may have some appeal to the non-lego fan, I don't see Pley producing a quality product. I wouldn't buy M#$% B*#[email protected], so why would I buy Pley knockoffs? Even if it is a "custom" product. However, anything that forces LEGO to re-evaluate it's IDEAS site interface and perhaps be a little less selective about the sets they decide to produce is a good thing for all of us I think. I think this has the potential to do both. The only good thing I can see is that it may create competition and that may either inspire Lego to create a product with better even better quality and/or get them to lower their prices. I don't think Pley will be able to make this work. I've heard a lot of complaints about their service. Poor management is poor management. Even if this changes their direction I don't think their idea was ever the problem so much as how it was carried out. Speaking for myself, I wouldn't contribute to a company which wants to reap mega profits off my work for nothing in return. The only amazing thing about this story is that people are crazy enough to invest money in something so rediculous. Any good ideas will go to Lego where you get paid, its a proper Lego set. Pley will be left with the dross, make crappy sets in crappy boxes perhaps with crappy bricks. This seems weird to me. Why would anyone give their designs to these guys to release (and sell) them as knockoff...? When technology hits the point of quality 3d printing that everyday people can afford, that will be the real threat to lego. I dont think 3D printing will ever touch LEGO sales. - we have huge tv's at home... Still go to the cinema. - great coffee machines at home... Still go to a café. - we can print whatever se download... Still buy posters/paintings. There are things missing in the article that needs to be addressed. "But with the majority of LEGO bricks’ IP expired..." Which I take as they are going to design and use their own generic building blocks. Good luck with replicating the quality, consistency, the clutch, color and shine of the LEGO brick. Good luck replicating the LEGO play/build experience. There are countless imitation brands in an increasingly overcrowded market. In the end, once reality finally hits their end users and the complaints about quality come in, they will end up sourcing LEGO parts to assemble their product, just like their contributors do. Just another Cussoo Ideas. The first of many very likely. 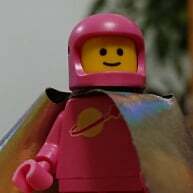 And I've mentioned this time and time again over here and at Brickset, LEGO should just bring back Design byME, put all these wannabes out of their misery, Because Only The Best Is Good Enough, and poor quality products riding on the back of LEGO's success would only hurt LEGO's reputation in the long run. I don't believe they would damage LEGO's reputation, since they are not lego. Bringing back DesignByMe wouldn't really help either. It failed because it was expensive, and bringing it back will not stop other companies putting together cheaply made sets if they want to. I can't. I won't. I can only recall my nightmarish experience pulling out a pubic hair and a couple of M$/7 [email protected]$2 pieces from a set when I tried a 3 month subscription. Joe Meno of Brick Journal told me last weekend that they are no longer welcome in the Raleigh Lego store because of a full page "Pley" ad in the lastest edition.